Strong credible publicity is all to hard to come by but when you get it, it really makes a difference. Take central US coffee roaster PT's Coffee; for a year or two now I've been dying to try their coffee and I can't say I really know why (some would say that good publicity has that exact effect). 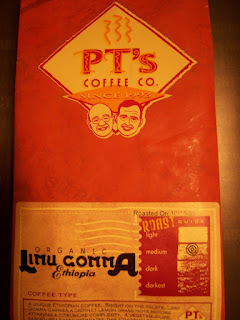 Regardless, I was elated when newly launched Coffee Roasters Club sent me a pound of PT's Ethiopia Lima - Gomma (as well as 2 other coffeess - reviews to come!) to try. Cracking open the bag (always a glorious experience), the coffee beans appeared lightly roasted, a nice light brown/dark caramel color. I was able to sample the coffee via french press, vacuum press, and drip. The french press twas my first undertaking and it produced a wonderful cup of coffee; a coffee that proved indeed very light but had a nice mellow brightness to it. Although there proved slight notes of chaff (common in lighter coffees), the occasional hints of fruity acidity really compensated. The vacuum press further brought out the sweet tastes of the coffee, taking the fruity accents a bit further (little hints of blueberry showed up in this mug). The drip also proved pleasant; though not nearly as vibrant as the other two brews, the drip still delivered a very sweet and bright coffee. Overall, I thoroughly enjoyed this light Ethiopian coffee from PT and the success of this batch makes me all the more interested in PT's other coffees. Thus, it goes to show that good product in itself can be the best kind of publicity.